Maxthon, the Web browser made by a Chinese developer of the same name, has come a long way since I reviewed its first version. While it’s still basically Google Chrome (the WebKit version) in a different chassis, nearly everything about Maxthon Cloud Browser (version 4.1) works better than in its predecessor. But it only stands out from its rivals in one notable way—and the usefulness of that new feature is up for debate. Maxthon is still basically just Chrome—with extra cloudiness. The latest version of Maxthon does a much better job of hiding the seams where it welded together open-sourced bits and pieces of Chrome, Firefox, and Safari. It doesn’t look nearly as much like a hastily reskinned Chrome knockoff, although if you look closely enough, you can still see its prime inspiration underneath. The Reader feature I criticized in the previous version now seems to work fine, and Maxthon has significantly improved its selection of extensions—though most of them are pretty obviously repurposed from Chrome. Maxthon seems to have taken inspiration from the admirably unorthodox Sleipnir browser, offering special trackpad gestures to control various browser functions. With a few exceptions—a circle for refresh—those gestures aren’t all that intuitive, but they work well. And unlike Sleipnir, Maxthon has the courtesy to list all of them in one easy-to-find spot in Preferences. After some initial turbulence, Cloud Browsing worked as advertised. Maxthon’s most touted feature is “cloud browsing.” With versions available for iOS, Android, Windows, and Mac, Maxthon lets you share bookmarks and other settings across devices (as Safari and Chrome do), once you sign up for an account with Maxthon. 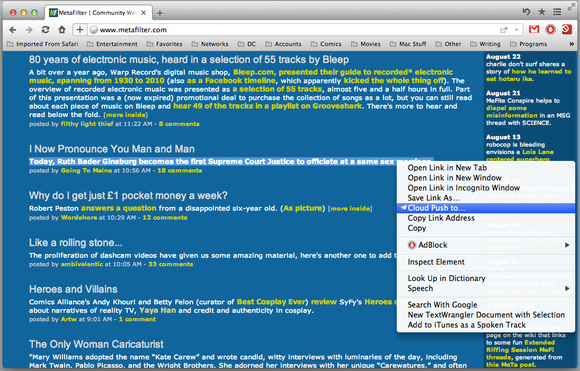 You can also Cloud Push any page or link to another of your own devices, or to a friend’s. And when you download a file in Maxthon, you have the option to send it to My Cloud as well. 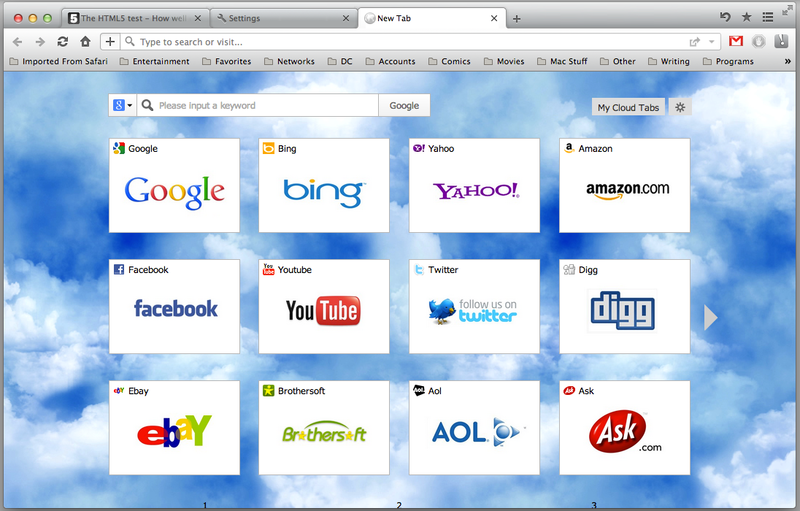 My foray into cloud browsing was initially stormy. Figuring out the baffling interface on Maxthon’s iOS app took time and effort, and my first few attempts to push a link from my laptop to my iPhone either didn’t work, or took hours. Even when the links began arriving promptly, it wasn’t initially clear where they were showing up on my phone. Still, once the system had seemingly worked out its hiccups, cloud browsing worked well. A podcast I downloaded on the laptop appeared in the phone’s download queue (though it only seemed to play within the browser, with no way to send it to iTunes or Podcasts), and pages I Cloud Pushed showed up within seconds. I didn’t find it revolutionary, but it does what it promises. 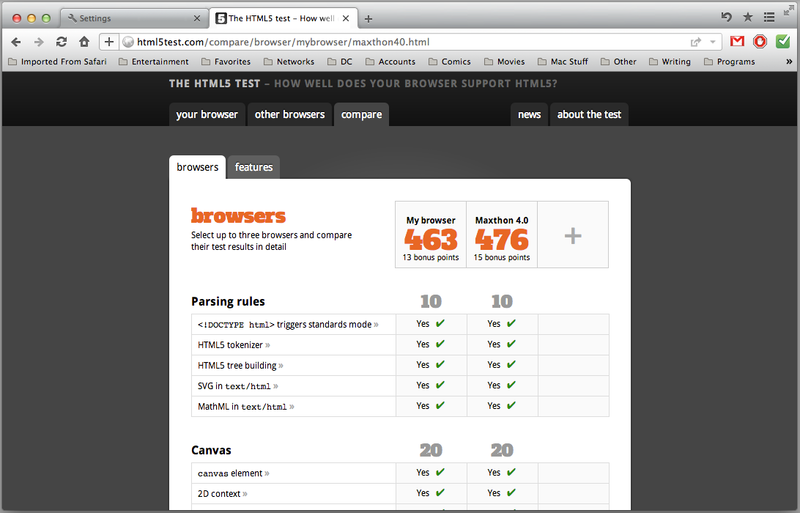 Though it still lags its PC cousin, the latest version of Maxthon for Mac narrows the gap in HTML5 standards compliance. I can’t say the same for Maxthon’s overall performance. The company’s site promises an “optimized web engine that loads pages and runs applications faster than any other web browsers.” But when I tested Maxthon against the latest versions of Safari, Firefox, Chrome, and Opera, that claim just didn’t stand up. On a MacBook Pro with a 2.9GHz Core i7 and 8GB RAM, Maxthon led the pack in only one test—and it shared that category with Chrome, the browser whose code it’s largely built from. Surprisingly, the latest version of Maxthon showed very little improvement from Maxthon 1 in HTML5 vector, bitmap, and text rendering tests, squeezing out a couple more frames per second at best. It did improve its SunSpider score by about 20 percent, and its Octane score by roughly 50 percent, though. Maxthon’s boastful marketing rubbed me the wrong way, especially since its actual performance didn’t meet the hype. But there’s otherwise nothing wrong with Maxthon—and it does more than a few things right. It wasn’t my cup of tea, but especially given its cloud browsing abilities, it might be yours. Maxthon's cloud browsing, which allows for sharing bookmarks and pushing Web pages to other devices, is useful for anyone who uses multiple platforms.